What works for the masses or the testers may not be the best application for everyone. Trial and error is my best friend and should be yours too. Don’t knock it till you try it. What does that mean? Well, it means I use shampoo from one line, conditioner from another line, gel for yet another, and a deep conditioner from another one! They must all work well together and if you follow the directions on the back of any brand they recommend that exclusively using their products will garner the best results. Hogwash! Many brands will play nicely with others and if they do not, then I will not use them. Here are a few situations when I don't follow the rules. Directions: Start with a dime size amount twice a week on hair and scalp as needed. Works best on dry or slightly damp hair. I love this stuff although I do not use it that often. It usually comes out when my hair is looking a little busted, meaning parched and in need of a wash. I use about a dime-size amount on each section and I never put it on my scalp. Anything applied to my scalp makes it itch and my scalp is never dry. This jar has lasted over a year because I rarely need it, but when I do it works like a charm. Directions: Work conditioner through hair from root to ends. Leave on three minutes, then rinse. Yea, right. Like I will ever rinse out this amazing conditioner. Ok, I am an ultra-big fan of SheaMoisture and want to lose my mind over this Manuka Honey & Mafura Oil collectino that can only be found at Target! I use this conditioner as my leave-in. Rinse out? Are you crazy? This stuff is too good to be letting it run down my drain and my hair drinks it in with no issues at all. I hop in the shower, saturate my hair, pump the conditioner along with the Shea Moisture Raw Shea Butter Reconstructive Finishing Elixir into my palms, and shingle it through my hair followed by gel. This seems to keep the frizz away even on the most humid of days. Directions: After styling, spray into hands and apply evenly to seal hair cuticle and add shine. As I mentioned above, I add a few pumps of this amazing elixir to my conditioner that I leave in my hair. It aids in allowing my fingers to glide through my hair when detangling. I actually picked up this tidbit of info from my sister since she saw some hair guru doing it on TV. It works great with the Manuka Honey & Mafura Oil conditioner (ab0ve) and after I use it while in the shower so there is no need for any after I am done. It seems to fight off frizz working with the conditioner like a pro. Directions: After cleansing, conditioning and detangling hair apply in small sections from root to tip then twist away! I have not used this in twist yet! 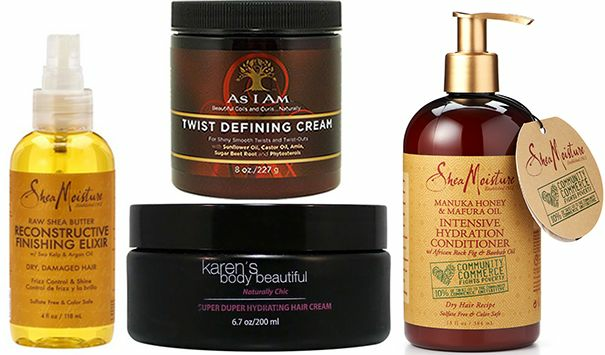 I love this twisting defining cream just to bring my curls back to life from my wash and go on a second or third day and it does this better than a daily conditioner from the same line. It is light, soft and even adds shine to my curls. I’m sure I will use it for twists one day but until then it will refresh my wash and go curls like a champ and keep me from jumping in the shower to do it. Ok, now it is your turn…what products do you use that do not follow the directions on the bottle?